We are very lucky to be having the most beautiful fall weather right now. As I walk in the morning I can see that the trees are beginning to change and I know this weather won't last long and I need to enjoy it while I can! I finished most of my pumpkins this weekend and I'm happy with the way they turned out. They weren't hard but it just takes awhile with all the stain, sand, paint, sand, stain again with cinnamon...I learned (or relearned) an important antiquing lesson. I made a batch of the mini pumpkins that are sectioned off by thread. Be careful not to sand the thread! It breaks and you have to resew it! I remembered that rule out after the second thread broke. I also made progress on this wonderful bird with bittersweet design by Lynn Hosford. The finished piece will be a big pillow. The vines themselves are made from chenille yarn that I overdyed. Birds, berries and pumpkins...I love the combination. 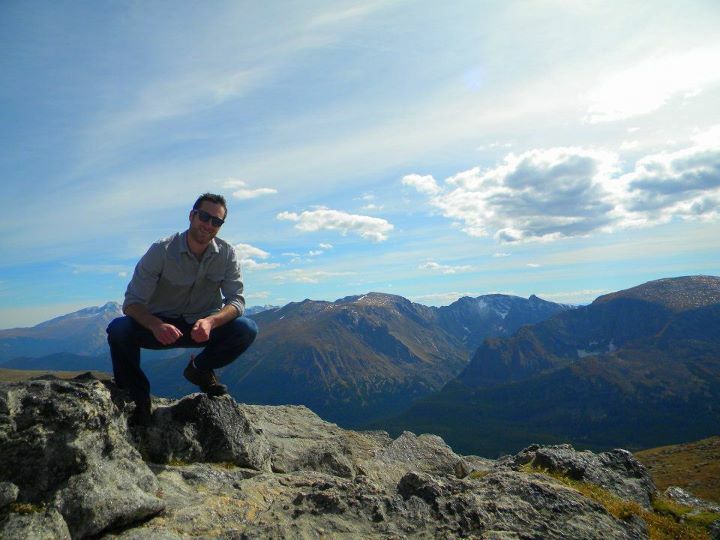 Last weekend there was no entry fee to visit Rocky Mountain National Park, another wonderful place to visit pretty much any time of year, but especially in the fall. Son AJ and his girl Sasha got some hiking in and sent photos. I'm glad they were able to take advantage of this opportunity! How lucky are we to live in a country that has such majestic, awe-inspiring landscapes? Hilachas, my blogging friend from West Texas. 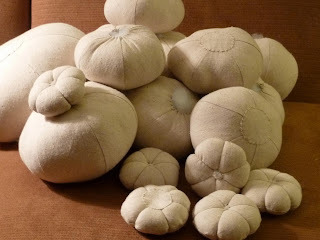 I had no idea what Hilachas, her blog title meant, but as she explains "Hilachas is the Spanish word for those little loose threads that fall all over the floor and sewing area as you finish sewing and snip the tail end of the thread off the sewn area." I know I've left plenty of those behind in the past. 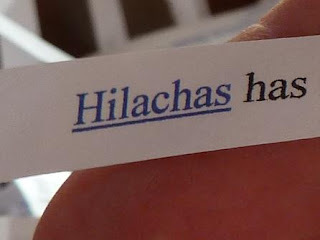 Congratulations Hilachas! I will probably do a winter time giveaway after the holidays, so stay in touch! 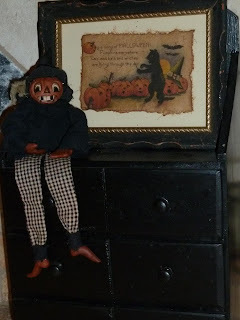 I had a "Great Pumpkin" weekend, sewing and stuffing a mini patch full of sincere pumpkins for my show at the end of October. Hope it won't be too late to sell pumpkins! Here they are so far in their nekkid and stemless state. I've used osnaburg for these because I like its primitive look, especially when painted and stained. However, because of its looser weave, sometimes when stuffed tightly it will pull apart a bit at points of stress so I've attached little fabric circles for added stability to the bottoms where this tends to occur. Today I'll begin staining and painting them and then add their stems. Local apples are now available and I bought a couple of bags of apples at the farmer's market Saturday. It was my turn to bring treats for our monthly departmental meeting and I thought an apple cake would make a good seasonal dessert. I substituted brown sugar for most of the white because I ran out of white but I don't think it mattered much. I usually follow recipes exactly, unless forced to make changes. 1. Preheat oven to 350 degrees. Grease and flour 12 cup fluted tube cake pan. 2. In large bowl, beat 1 cup butter and sugar with mixer on medium speed until light and fluffy. Beat in eggs, one at a time, until blended. Stir in vanilla. Mix flour, baking soda, salt and cinnamon together. Stir into butter/sugar mixture. Stir in apples and walnuts. Spoon into pan. 3. Bake 50-65 minutes or until knife inserted in center of cake comes out clean. Cool 10 minutes. Remove from pan to cooling rack. Cool completely. 4. In saucepan, heat 1/2 cup butter over medium heat, stirring constantly, until golden brown. Gradually beat in powdered sugar with spoon (I ended up putting it in a bowl and beating it with the mixer because it looked too lumpy to me). Stir in 1 teaspoon vanilla and enough milk until frosting is smooth and desired spreading consistency. Spread frosting over top and partially down side of cake. Cut with serrated knife. Still time to register for my giveaway! I'm still responding to entries and really enjoying visiting everyone's blog, but I will draw and announce the winner on Friday. A big Thank You to all who have entered my giveaway! I'm responding to all comments but I'm also taking time to visit your blog and get to know you so it may take me a couple of days to acknowledge your entry. I've enjoyed visiting everyone's blogs and love, love, love the quotes! It seems like autumn gets everyone's creative juices flowing! Still time to enter--see the details on my sidebar! There's so many wonderful patterns available for fall and Halloween that it's hard to choose what to do next. Thanks to Jan Goos, Brenda Gervais and Pineberry Lane for these designs. Here's the goodies I found at the Old Summit Antique show last weekend. Bittersweet from Jenny to add to my dried gourds. I hope the cats don't discover this! Jenny's extension agent said the bittersweet grown here isn't toxic to pets but I don't want to test that statement. I'm so happy I grabbed this at the first vendor's booth! 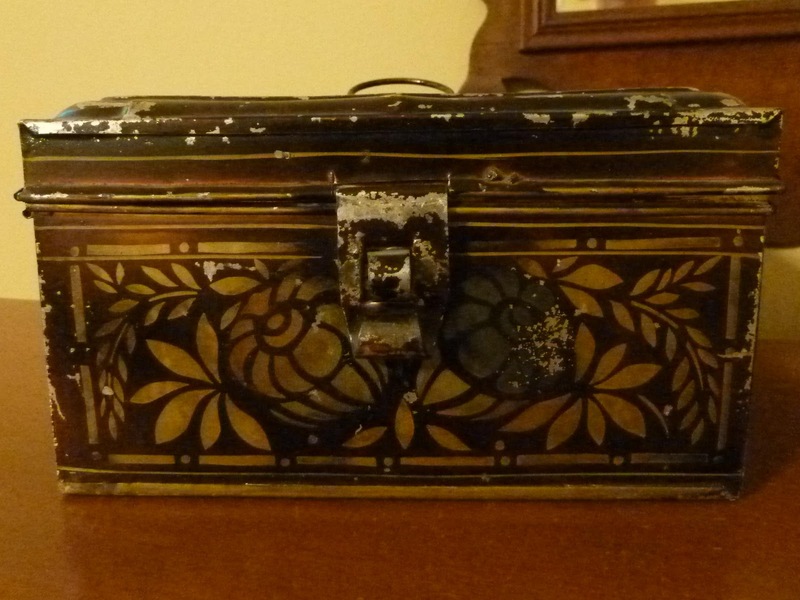 I have several document boxes but none with floral stenciling. I bought this for the wonderful frame, but the farm scene from an old plat book is pretty charming. If you click on the photo you can see the details in the print, including a mom pushing her baby buggy across the field! I really enjoyed my last giveaway and the opportunity it provided to meet many new blogging friends, so I'm doing another one in honor of fall. I don't know if you love acorns as much as I do, but I loved this design with the acorns dancing along the edge by Jan Goos and thought it would be a perfect little mat to enjoy throughout the fall season. The photo above was taken under my Ott light and is the best representation of the background color. The giveaway is for the the 17" mat only. Please post a comment on this page and let me know you are a follower. You get a second entry if you leave a favorite quote about fall or Halloween. A third entry if you post about this giveaway on your blog. 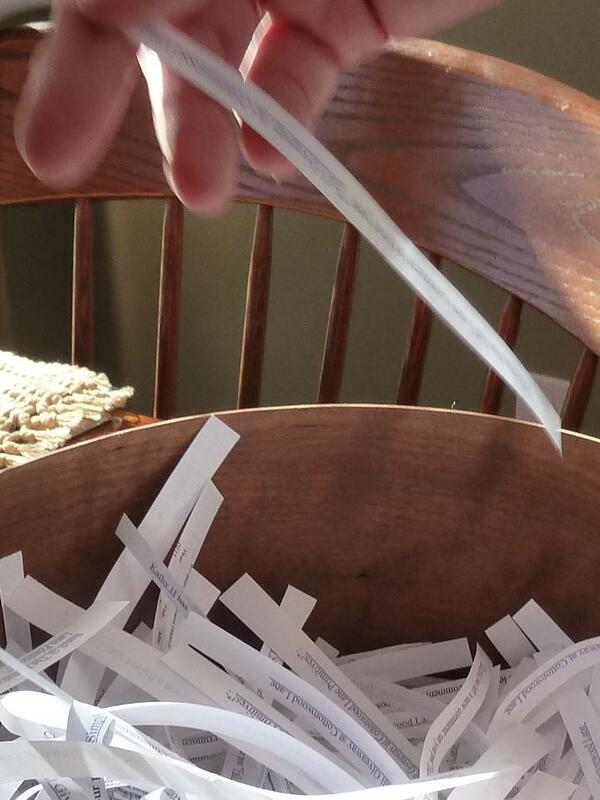 If you post anonymously, I won't be able to contact you if you win unless you leave an email address. You don't have to have a blog to win, but I do need to know how to get back in touch with you. Hope you are having a wonderful weekend. Mine has been pretty fun, especially since it included antiquing with friends Leslie, Jo and Ginger yesterday! First on our agenda was the Old Summit County Antique show in Lee's Summit, Missouri. I think this was one of their best shows yet. Many returning vendors, but some new ones too that keep things fresh. Ever mindful that we are approaching the 10th anniversary of 9/11, Mary and Bob from River Cabin Antiques dressed their booth in patriotic bunting. Their mustard colored walls were the perfect backdrop for a variety of very fine primitives. Leslie debated between a couple of pantry boxes, finally settling on a round one with old black finish. I loved the seasonal decorations that were tucked in among the inventory. Even the decoys sported a bit of fall finery. 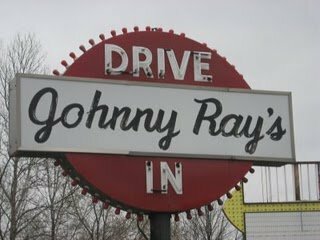 All that shopping made us hungry and our favorite place for lunch in Lee's Summit is Johnny Ray's, an authentic diner that serves amazing steakburgers. After fortifying ourselves for another round of shopping, we headed east to Greenwood, a tiny gem of a town with several wonderful shops and malls. 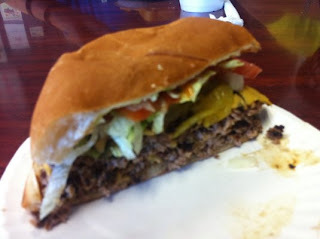 Our first stop was Old Glory. We loved Vicki's new entry. Greenwood Mercantile is packed with wonderful booths and vendors include Maggie Bononomi and wool maven Anita White. We really enjoyed Janelle Carey's whimsical touches. My finds included an old pine picture frame, lots of bobbins for crafting, an old army blanket and a tole box with wonderful paint. I'll share photos in my next post! I hope you had a great Labor Day weekend. I spent a good chunk of time in my craft room finishing a few things and beginning additional projects, which made me very happy. 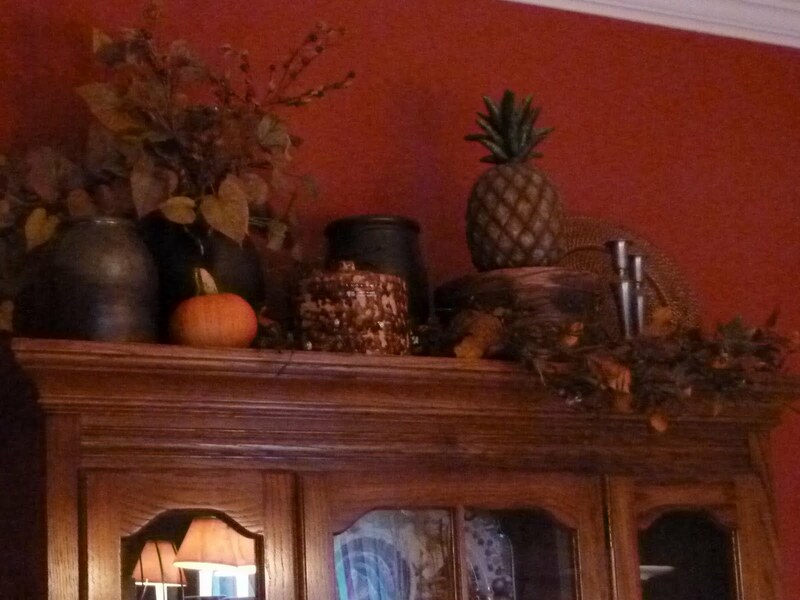 The cooler weather also inspired me to begin pulling out my fall decor. Nothing too fancy, but I like to keep something seasonal in the old knife box. I like the way the old brown crocks look against the dark red of the dining room walls and a little orange makes a nice contrast. The little pumpkin witch is from one of the first swaps I ever did. She is so unique and taking her out of the box always brings back happy memories and warm feelings. So many of the little things I put out for fall remind me of the person who made them and those memories are the best part of fall decorating for me.